Is Children’s Publishing Racist? Yes! While I understand children's publishing is hard and probably the most competitive niche in book publishing, I seriously don't think it should be this difficult considering all of the positive Press and appearances the Singing Dogs and their videos have had. We were on Anderson Cooper, The Today Show, Good Morning America, HuffPo, MSN, etc. Doesn't the book publishing industry appreciate when people have already had some free publicity? I'd assume this makes marketing books easier. Also take into account I'm an accredited auto journalist with the International Motor Press Association (IMPA) and the Washington Automotive Press Association (WAPA). I'm not bragging these are just the facts. I co-founded and run a successful car news website that posts stories daily. I'm used to writing a lot and I'm an auto writer that knows how to deal with public relations professionals. (This is not always pleasant in case you are wondering.) While automotive journalism isn't a field that necessarily goes hand-in-hand with a children's book about two singing dogs, it shows I like to write and love it. I've made it clear that I'm open and can write many more children's books regarding dogs and Cody and Sierra if there was a demand. This is something book agents definitely want to know before they get into business with you. 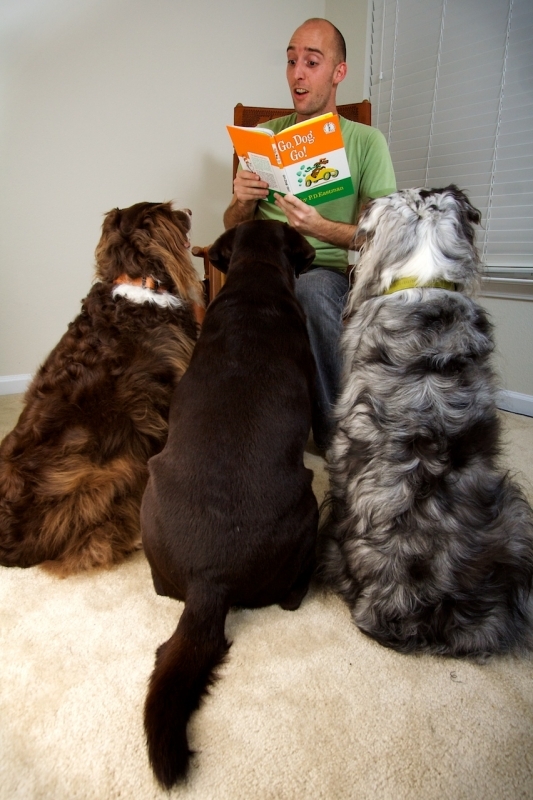 Honestly… we can't imagine who wouldn't want to read a book about two singing dogs? Since they are real dogs it's a great for a book tour for promotion. I know Sierra and Cody would be game for it even if traveling with them can be a challenge. What's the deal? 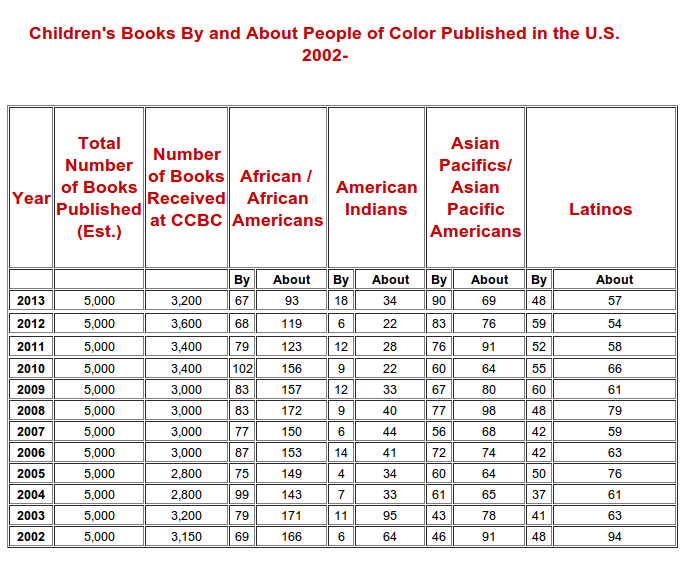 I'm going to ask a simple question, “Is children's publishing racist?” I've come to the conclusion that children's publishing is very racist and the numbers are pretty startling when it comes to minorities. According to a study by a major university out of 5,000 children's books that came from traditional publishers last year apparently only 257 were by people of color. (This means Asians/Pacific Islanders, Blacks, Latinos, and Native Americans.) See the chart below which goes back to 2002. My math is is not that good, ok I'm terrible since I am a writer, but that is a pretty small percentage considering the demographics of today are quickly changing. Especially in the United States where most publishing houses are based. From what I can tell and from what I've read it seems the publishing industry largely favors white women authors that are 30+ years old. I actually sort of understand this as they want to target people they know will buy and can relate to. They also probably want to use author's that have kids in the demographic they want to market books to. I don't have kids (at least any I know about), I'm obviously not a women, and I'm not white. These are apparently three strikes against me that doesn't work for children's publishing since children's book agents and children's book publishers are racist. I know this is the same situation countless authors that are trying to break into traditional publishing are facing, whatever their ethnic or racial background. I just can't help the feeling that a little bit of racism is at play with children's publishing. It just seems publishers and agents don't believe we are worth the time to even respond to because Sierra and Cody's owner doesn't fit into their traditional author image. Since I am an minority and my skin color doesn't work with what a book agent or publisher feels they can sell, we get rejected and don't' receive any reply's. I can't imagine any other explanation why we wouldn't have gotten serious responses at this point, considering all the work we have done and publicity we've had. Children's publishing is racist and is not going to change anytime soon from what I can tell. If you have an opinion about racism and children's publishing with regard to minorities, we'd love to hear it. I always encourage people to leave comments and share thoughts and opinions and don't always mind anonymity but will not allow it for this post. For the comments here if you claim you are from a children's publishing house, a book agent, or author and want to defend your racist mentality, that's fine with me. You MUST leave you real name though and not hide behind a handle or some other fake email account. Really hoping you get a response one of these days, to having your book published! I never knew about those statistics! Thanks Leah (and Kirby). Those numbers are pretty crazy and I hope they change someday. We don’t mind there being not many stories in children’s publishing regarding minorities but it doesn’t make sense to us there is not more diversity among authors. Previous Previous post: Is the Vet Scale Wrong?